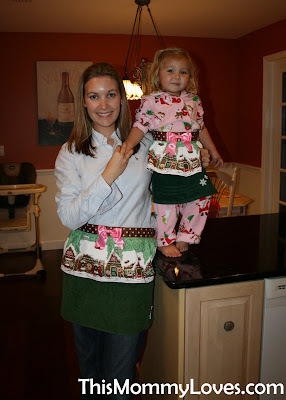 This Mommy Loves: Mommy and Me Matching Aprons Giveaway! On my recent, How to Make Playdough post, I featured some adorable Mommy and Me aprons by Corey Lee Creations. My daughter loves these aprons and brings me my apron everytime I start to cook and wants me to wear hers all time. 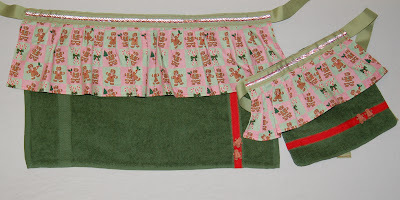 Lucky for us, Corey is giving away a matching Mommy and Me apron set to one lucky ready! How cute?!?! "Like" This Mommy Loves on Facebook (easy click on right sidebar) and leave a comment below telling me you've done so (tell me your name so I can verify). 2) "Like" Corey Lee Creations on Facebook and tell me you've done so. 3) Go to Corey Lee Creations Etsy Page and to your favorites. Tell me you've done. 4) Follow ThisMommyLoves via Google Friend Connect and tell me about it. 5) Follow @ThisMommyLoves on Twitter and comment here with your Twitter screenname. Winners will be chosen via random.org on December 23, 2010. Last valid entry can be entered on December 22, 2010 at midnight EST. Winners will be notified via direct message on facebook and will have 48 hours to respond before another winner is chosen via random.org. Yeah! I like This Mommy Loves on Facebook! "Like" Corey Lee Creations on Facebook and tell me you've done so. - DONE! Like CLC on facebook :)! So cute! I have already "liked" This Mommy Loves on facebook. I'm a fan of This Mommy Loves Facebook! I've added Corey Lee Creations as a favorite on Etsy! added CLC to favorites on Etsy!